“Tau Tau” are placed in tombs of wealthy Torajans as look outs. In the film Gladiator, Russell Crowe, playing a Roman General, is told, “Death smiles at us all … all we can do is smile back.” Truer words were never spoken in relation to Torajaland, a unique outpost amid the thousands of islands comprising Indonesia. Several elements make Torajaland stand out for those interested in overseas adventure. There’s the unique Torajan architecture. The inhabitants were former headhunters. The Dutch tried to conquer this area and only did so through the spread of Christianity. It is also famous for being a region where outstanding coffee is produced. Torajan coffee had long been my favorite since my first visit to Bali 1989, but now I’ve had a chance to try (and bring back) the real stuff. You drink it to stay awake, you drink it to stay alert, and at times it seems you drink it to stay alive. Torajaland is a place unlike any other, both for its unique culture and stunning landscapes. It is also a major challenge to visit as there are only two ways to get there: first, flying into Sulawesi’s largest city, Makassar, and then driving six hours. Or secondly, chartering a private turbo prop and flying in. We’ve had several Remote Lands clients fly in by charter. This is by far the best way to work your way into the region. There used to be a commercial flight between Makassar and Rantepao but that route was canceled and hasn’t operated for a few years now. The aura of mystery surrounding this area is interesting and complex. It intertwines the forces of history, religion, geography and culture. The Toraja are at home in the highlands of Sulawesi. They number about 650,000 in total. Many of them, or even most, are Christians, having been converted by Dutch missionaries. The Dutch arrived in the 1600’s and established what would be a long history in Indonesia – mainly through the Dutch East India Company. The Dutch, concerned with the rise of Islam, saw the animist elements of the Toraja as making them “suitable for conversion to Christianity”. Before the Dutch arrived, slavery was legal. The Dutch abolished slavery and this went over well in some quarters to be sure. But not amongst the elites in Toraja, who profited from the slave trade. (As they say, “Follow the money.”) Slaves were not allowed to engage in the death feasts and celebrations of the Toraja people. This fact must have alienated them tremendously and left them feeling unsatisfied concerning the fate of those they loved who were beyond the grave. At first only 10 percent of the Toraja converted to Christianity, but during the Great Depression in the West during the 1930’s, Islamic believers attacked the Toraja. This is not a well-known fact. 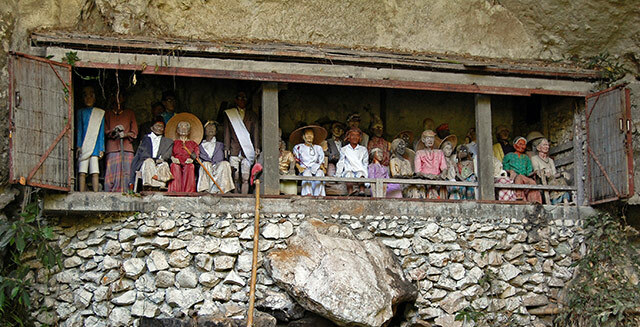 By the 1950’s , due to these attacks and persecution, masses of the Toraja had converted to Christianity. By 1965 the region was in a full-scale civil war mainly because of the chaos of the post-colonial era and religious conflict as mentioned in this space. All citizens of Indonesia must be either Hindu, Buddhist, Christian or Muslim. Fitting in the belief system of the Toraja in the eyes of the government became a matter of national peace, tranquility and security. That said, others amongst the Toraja are followers of Islam and are also animist in their spirituality. Their system of beliefs in regard to nature and animals are called “Aluk,” or “The Way”. The Indonesian government officially recognizes their religion. They call this “Aluk To Dolo,” which is, in the most general sense, the path, or “The Way,” that leads the Toraja back to their ancestors in some sort of mystical connection. Aluk is a complicated matter. 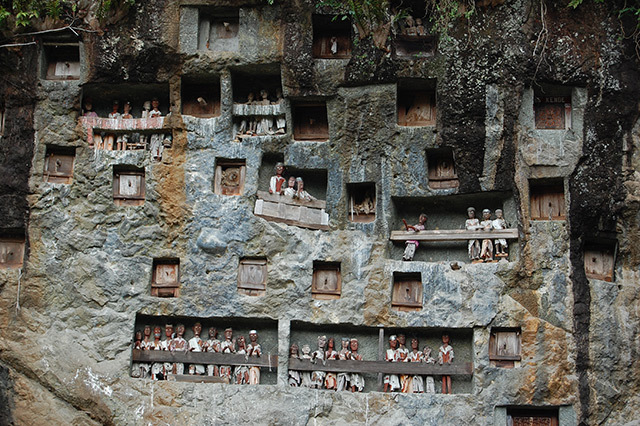 The people of Toraja believe their ancestors came to Earth from heaven using a staircase. Various gods and goddesses were and remain involved. There is, as one might imagine, the idea of heaven, Earth and an underworld. Aluk is interpreted by minaa (the name for Aluk priests) who synthesize the habits, mores, norms and laws associated with this form of spirituality. Agriculture (rice farming), funeral rights and socialization are all informed by Aluk. There is also a ritual of cockfighting involved — but really, who wants to go there? Toraja itself means in the basic form, “highlanders” or people from “the uplands.” They are well known in the 21st Century for their funeral ceremonies, carving tombs for burial on the sides of cliffs that would scare a billy goat, their longhouses, called “tongkonan,” and other factors – such as their adherence to traditions, value for the past and belief in the afterlife. I was drawn to find out more about Tarajaland. I flew to Makassar from Bali and then drove approximately six hours north to Rantepao. The first four hours of the drive are not interesting and the traffic makes it a painful drive. However, once I started to climb into the mountainous area approaching Torajaland, things started to get interesting. Not only was the scenery stunning, but I could see a very obvious cultural transition — the people were just different. South Suluwesi is dominated by the seafaring, Muslim Bugis people whereas the Torajans were clearly a tribal, mountain culture with animist roots that have been blended with Christianity. In other words, they really stand out. This is the world’s most populated Muslim nation after all. The best hotel in Torajaland is the Heritage Toraja in Rantepao. It is a surprisingly comfortable three star property in a place where you’d expect nothing better than one or two stars. I’m told this is because Toraja has been a popular destination with the European market for some time. Very few Americans ever come here, though. European trekkers and academic types — sure. Funerals are the most important part of anyone’s life in Toraja. Great importance is placed on the funeral ceremony. The wealthier the family, the more elaborate the funeral is expected to be. At funerals, buffalos are sacrificed. Wealthy families must sacrifice more buffaloes than poor ones. But the financial burden is the same — rich or poor, the cost of a funeral is usually a heavy burden — so much so that it often takes several years after someone dies before enough money is saved to buy enough buffalos to have a funeral. (Buffalos are very expensive in Toraja. I saw one that was selling for US $20,000 in the local market, for example). Funerals are usually the main highlight of a visit to Toraja. They are not somber affairs as they are in the West, and the whole village attends each funeral as a multi-day event. I was invited to sit with the family during the burial day of the funeral (luckily for me they had killed 20 buffaloes the day before so I didn’t need to see that). There were many rituals involving the coffin, which was stored in a special structure for two years (the body was of a dead policeman from the village). All the buffaloes that were sacrificed the day before were eaten — and I was offered the opportunity to dine with the family. To be honest, the buffalo was pretty gamey, but I put on a brave face and ate what I was given — the whole time talking to the family members and learning about their customs. Everyone was really friendly. After eating, they brought out the coffin. (It was in a heavy and elaborately carved wooden case and as such it took more than a few people to carry it). Once it was brought out, the villagers situated near by gathered in a big circle and started carrying around the coffin, dancing, and jumping up and down. After doing this for about 30 minutes, they took the coffin out of the village for burial. One might think this was the beginning of the end, but to quote Winston Churchill, it was merely “the end of the beginning.” The death rituals go on and on. We in the West cannot imagine this. Under “Aluk,” only nobles were entitled to death rituals and rites lasting for days on end are attended by thousands of guests. Outpourings of grief come in the form of songs and poems and even wailing. These people are only human so of course death can seem so un-natural. There are tears and sadness. Who can really get over the death of a loved one? The ceremonies are not held immediately after death as in Western culture. They can come months or years later. To the Toraja, death is a slow process where you move towards the well of souls or “the afterlife,” which is called “Puya.” During this waiting time the body is wrapped in cloth and actually kept underneath the longhouse. 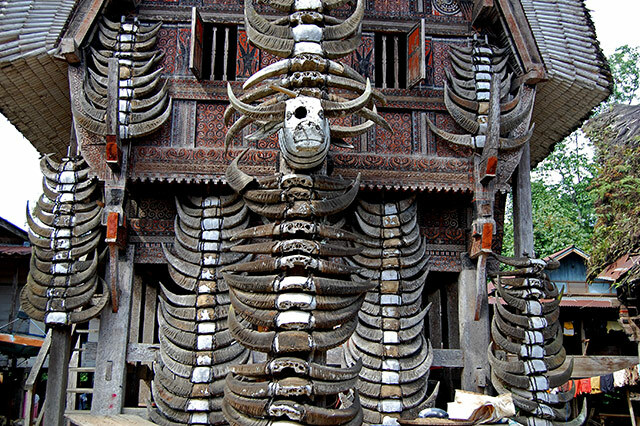 As such, the Toraja believe that while this is all taking place, the soul of the deceased is hanging around the longhouse and the village. Only after the funeral rites have been completed will the soul then head off for Puya. As noted, if you are lucky or rich or both, water buffalo will be sacrificed in your honor. The more buffalo, the better one might suppose. Burial is carried out in a stone grave or in a regular cave. Wealthy people might get a cave carved out of a high cliff. It can take a long time to carve out a tomb. And so the wait goes on … A wooden likeness of the departed known as a “Tau Tau” is placed at the tomb as a look out. Some Tau Tau are hung on ropes, suspended from whatever can offer support. The most important facet of all is the Ma’Nene ritual, which takes place in August when the dead bodies are exhumed, cleaned and washed, groomed (hair, nails and other factors) and then given a new set of burial clothes. The mummies are then paraded around the village. And if that isn’t enough to keep you up nights, then I don’t know what is.